are differentiated to meet the needs of all children. As such it is not practical to give children individual homework each day. Children are asked to read with an adult each day at home and to read for themselves. The home school book must be signed each night by parents/carers. Children are encouraged to learn number facts. The children may be asked to learn individual spellings and to practise particular times-tables. 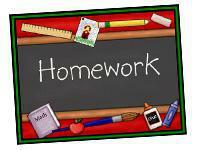 On a weekly basis the children are asked to complete homework that relates to the work they are doing in class. This work is given out on a certain day each week and the children are given several days to complete it.